Dan Apol, front row far right, attends the 2016 Olympic Games Preparation Seminar in Brazil, March 2016. I’m very sorry to report that Dan had an aneurysm while working a Rocky Mountain Athletic Conference match Tuesday night in Colorado Springs. He was taken off life support Wednesday. Dan and I have been friends for a long time and I really enjoyed interviewing him and writing this story about him working the Olympics. He was a calm, friendly and positive force on the court. Dan was 44, an avid fisherman, camper, and skier (Dan skied 51 days this year). He leaves behind his wife, Bonnie. A memorial service will be held in Michigan in honor of Dan on Saturday, December 17, 2016. An exact time has not been set yet, but will likely be early afternoon. Location is Hillside Community Church, 1440 68th St SE, Grand Rapids, MI 49508. Click here for church website. I can’t tell you why. Something to do with blood vessels in his brain. A random accident. Or perhaps he was “called home” or “called up” by some higher power. But we’ve lost him. Last night, while reffing a local volleyball match (of course), my best friend’s time was called. He was disoriented for a bit. But there was no trauma, no pain. Professionals collected him quickly, and took him to the best of care. But he’s gone from us. He’s still here in Colorado Springs, on life support in a beautiful hospital. His family, having flown through the night, is with him now. He looks great. But he’s not here. Orion is upstairs too. You all know the mastiffs. Artimus has left us, but his picture adorns most of the referee badges in the world. And now Orion. Bright stars in the sky. Dan will be joining them. Such a bright star. We’ve all been so lucky to work with him; to call him friend. And now, proud organ donor that he is, Dan will save some forty lives this week. That brings a smile to Bonnie’s face. Even today, when we are all forced to say goodbye. Bonnie, and all of the family, want you all to know just how important your support has been. Thousands of texts and emails. Millions of prayers. And the hospital courtyard is filled with local ski bums and vagrant referees, all here to say goodbye. But I need to ask you all a favor: The family needs time to grieve. Time to rest, and to begin to heal. Your quiet prayers are what they need, just now. Several of us will be setting up an information stream. Details, for those who want them. Also various means to say goodbye, through flowers, or donations, or what have you. I’ll be posting links to this information on Facebook, and publishing them through referee channels as well. We will also publish the details of services, as soon as they are known. Thank you for your understanding during this difficult time…. and please join me in breathing to the stars… WE LOVE YOU DAN! Lori Okimura, chair of the USA Volleyball board of directors, talked about Dan. Dan Apol was first and foremost an amazing and very dear friend. 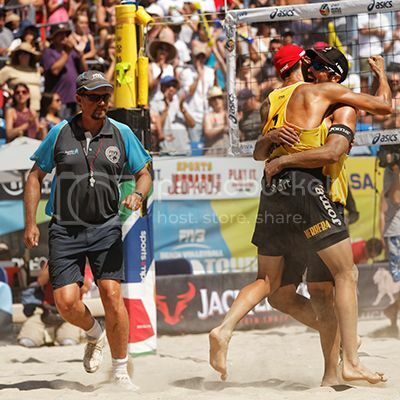 I had the privilege of working with Dan for many seasons on the FIVB World Tour. He was often the first one at the site and the last one to leave, always offering assistance and a kind word exactly where and when it was needed. I remember fondly Dan volunteering to work the FIVB Beach Volleyball World Championships for the under 19-age group in Bermuda back in 2006. When Hurricane Florence hit the island Dan was the first to grab the shovels and buckets to start bailing out court number 6 then court 5 then court 4 and eventually made his way with the backhoe, the shovels and the buckets all the way to court number 1. He was one of the greatest ambassadors for USA Volleyball and one of our most accomplished Olympic and Paralympic international referees. His knowledge of the game, his professionalism, his kindness and sense of humor and his passion for those who played are among the many reasons why Dan was so well respected around the world. I was proud of him every time he stood up on the stand, and I was honored to call him a friend. VolleyballMag.com will post more details here as we get them. Feel free to comment about Dan below or visit our Facebook page, Facebook.com/Volleyballmag, where some of us have already begun to pay tribute to Dan. At the Rio Olympics, 20 indoor and 16 beach referees will be tasked with judging and administrating the matches fairly. VBM had a chance to chat with Dan Apol, the USA designated beach referee (Patricia Rolf, the former Marquette coach, is the USA designated indoor referee). Apol, a ref since 1991, is a full-time volleyball official. He lives in Castle Rock, Denver, and is one of a handful of referees in the world who have both the International FIVB beach and International Para-volley (handicapped) certifications and is also an NCAA official. He has 12 years of International experience and was an Olympic referee in London 2012. As you might imagine, an international referee racks up plenty of frequent-flyer miles. Apol has officiated in 30 different countries and will spend 87 days this year officiating outside the U.S. Referees must be selected by USA volleyball to become a national official. It takes a minimum of three years to become a national referee, candidates must attend a variety of training programs and be evaluated numerous times. What’s more, candidates must attend international referee school prior to age 41. There are one or two international clinics per year. 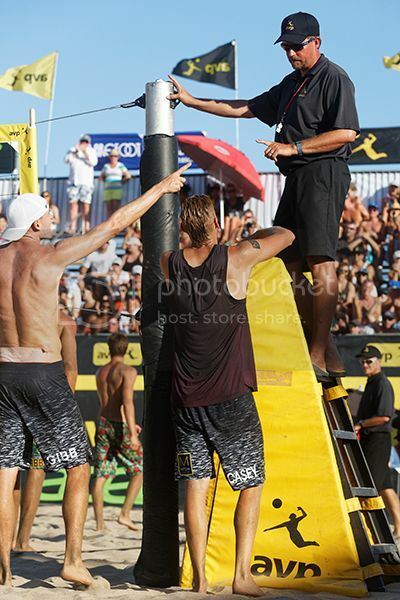 International beach referees are forced to retire at age 55. “Beach is an image sport, they want their officials to be youthful and be fit as well,” Apol said, adding that on the average international beach referees are 15 years younger than their indoor counterparts. VBM and Apol visited on a number of topics, starting with the difference between the Olympics and major competitions. Apol: “It’s all the same players, all the same referees, all the same delegates, all the same people telling us what to do, except that it’s two levels higher,” Apol said. “It’s higher than the tour finals, it’s the Olympics, it’s every four years, it’s the highest sporting event in the world. The pressure is unbelievable. We probably only do two or three matches each day, but we go through three or four meetings every day for 19 days in a row. What we did wrong, what the proper protocol is, etc. VBM: How do you deal with the pressure? VBM: How do you deal with difficult coaches or players? Apol: “I don’t normally deal with coaches, but I saw an event in Gstaad where a Brazilian coach was standing up in the bleachers and yelling at an official for several minutes. I’ve never seen that before, it’s a bit of an unusual situation. There’s a lot of time that we’re not on the center court, the side courts don’t have the video system, more of the personalities come out a little bit. “It’s not always as difficult to deal with because it’s not always in the English language. If they’re arguing in their second language it’s not as difficult. For sure we don’t put up with as much discussion as we do on the AVP Tour. I can’t remember when the last time a player was awarded a delay for refusing to play after a discussion (on the AVP tour). On the world tour, if someone talks for five seconds, then they have to play. And if they don’t play, then it’s a delay. The discussion period is definitely more brief on the FIVB. VBM: Are there any significant rules changes for the 2016 Olympics? VBM: Are you concerned about Zika? VBM: What do you do when you’re not blowing a whistle on a referee stand somewhere?